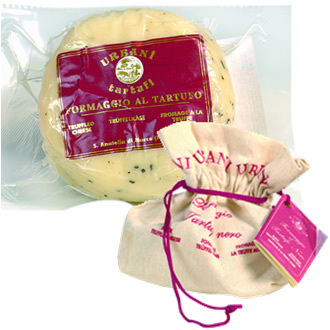 The only hard cheese made with winter black truffles (Tuber Melanosporum), the rarest and most precious truffles. The union of these two high quality ingredients gives rise to a flavour which lends itself to a wide variety of recipes. Use: in Italian pasta dishes, risotto, meat, shaved or diced in any salad for a touch of creativity, or quite simply on a platter of fine cheeses. Ingredients: pasteurised cow’s milk, lactic ferments, rennet, salt, black truffles 3%. Shelf life: 3 months from the date of production.